The demand for component and service discovery engines to use in extensible applications is surging. No one so far has devoted much effort to metrics that aid selecting among different resolvers of the same dependency. This paper defines the Reuse Frequency: a metric that relates components or services to each other and measures their relative importance. Additionally, the ComponentGraph is presented that builds the averaged dependency graph of entities augmented with their popularity and the likelihood of each possible dependency resolver. The Reuse Frequency targets all scenarios where entities have dependencies on each other and a metric for the measurement of their relative importance is needed; the target implementation environment of the ComponentGraph is the Open Service Gateway Initiative framework, but the concepts are applicable to component or service repositories in general. 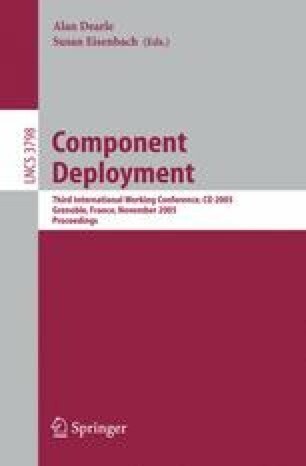 Bay, T.G., Pauls, K.: Reuse frequency as metric for component assessment. Technical Report 464, ETH Zürich (2004), www.inf.ethz.ch/research/publications/techreports/show?serial=464&amp;lang=en.